A powerful educational tool. The environmental message is important. Unfortunately, audiences may not always be as attentive and receptive as you would like. The recycled robot will help make presentations memorable and entertaining, and keep the audience riveted to the topic. The life-sized recycled robot is a remote-controlled, battery-powered unit that rides a tricycle. The recycled robot talks & hears via a wireless microphone system and has automatic mouth movement in sync with the sound. The head can also be turned by remote-control. 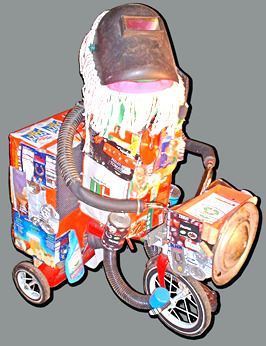 This mobile recycled robot is extremely effective in situations where you want to 'stop traffic'. The recycled robot makes a lasting impression on exhibition stands, parades, school programs, carnivals, etc.. This highly mobile recycled robot can get anyone's attention by driving up to them (or chasing them down) and starting an interactive conversation.